For MS done in India WES Canada tends to ask for all transcripts that includes Bachelors. And also Do I have to include my B.Tech individual semester marks sheet as well? They might ask for senesterwise marksheet. Did you check WES site as to what all they need? Do you mean attested masrksheets for all semesters from University or just photocopies along with degree and passport etc personal documents? I mean Do I have to send individual mark sheet for each and every semester or if I send the final consolidated marks memo, Provisional certificate,Migration certificate will be suffice ? I have checked the WES site but didn’t understand clearly. So thought of checking here . 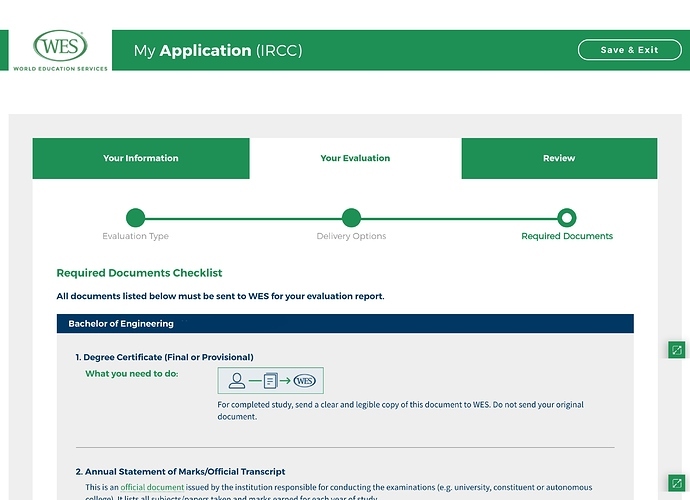 Once you create an account on the WES site and enter your details, they will provide a list of documents which you need to submit for verification of your degrees. For my BE, I had to submit official sealed transcripts from the Indian university and a copy of the degree certificate. For my MS, I had to submit only the official sealed transcripts from the US university. No copy of the degree was asked for. I was not asked for any separate mark sheets as the official transcripts have all the requisite information. So, create a profile and check what documents WES expects from you. Here’s a screenshot of the documents which I was asked to submit since I chose to submit evaluation for both the BE and MS degrees. I am not sure why WES asked for your Indian Transcripts when you have a MS from US. It did not asked in my case. Is this fairly normal ? US MS validation has a quick turnaround. India UG adds around 20 days. So I’m all it does take a month to month and half. If you sent ALL your documents together, then you have a quicker turnaround of 20-25 days. Before or after transcript receipt? I did my bachelors evaluation from Univ of Toronto and it took them about 3-4 weeks (after they received transcript) to give evaluation since they were swamped. My Indian university took 2.5 months to send them transcripts. 20 days for final evaluation after all the documents are accepted. I got my ECA from WES today. It shows only my highest degree on first page under “CANADIAN EQUIVALENCY SUMMARY”. I ordered them to evaluate Masters+Bachelors. So is this correct summary or should i ask them to add even bachelor’s to “CANADIAN EQUIVALENCY SUMMARY”? Nope highest degree is the only one you get points for. If you have two highest degrees like an MS in Physics and one in Comp. Sci then you will be points for both but not for your BS when you already have an MS.